He walked through a few examples that actually required more than a single button press, but not too many. Ellison also had to log into Oracle's Cloud service, which gave him an opportunity to deliver a trademark quip. 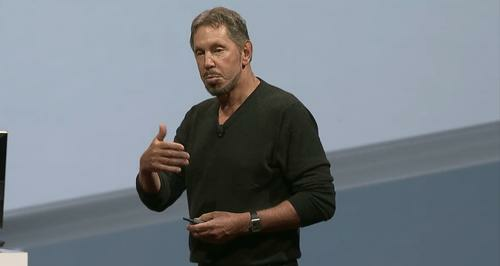 That said, Oracle's cloud will "gracefully co-exist with your datacentre," Ellison said. "It all looks like one collection of computers." During a press conference Monday, Oracle CEO, Mark Hurd, declined to comment on the notion but said he expected most customers who buy its PaaS or SaaS would naturally also choose its infrastructure service. That said, "we are absolutely not committed to being a single vendor organisation," CIO Yael Cosset said in an interview. "We're not married."